Old metal shed dismantling is a big project. Plan to take at least a full day or the best of two to get it done from start to finish. The contents are largely junk and there’s no need to keep it around any longer. 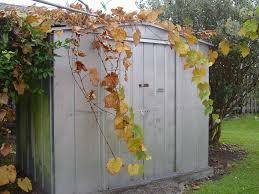 But that notion doesn’t make the problem go away, you’ve still got to dismantle that old metal shed. Before you break out the tools, it’s best to know precisely what’s in-store for you. Meaning, you can’t simply take it apart and put all that stuff on the curb. So, schedule a local junk removal service to take it apart for you and haul it away. Take a few minutes to walk around it and use a rake or yard stick to poke around the outside. Carefully open the door (especially if you’ve not been inside the old metal shed for months) and shine a flashlight about. Remove any doors and/or windows. Unfasten the doors and/or windows. Do this carefully to avoid injury from breaking glass and cuts from rusted parts. Wear durable leather gloves, eye protection, and a dust mask. Take the roof off the top of the shed. After you’ve removed the doors and/or windows, it’s time to take the roof off the top of the structure. Examine it to determine how to remove it. Proceed with caution and be sure to keep kids and pets clear of the area. Tear down the walls, one-by-one. To finish, you’ll just need to take down the walls, one at a time. Use a drill-driver and pry bar to do this. Here again, do this with caution to avoid injury to yourself or property around the shed. If you don’t have the time or it’s just too big of a job to handle, you can just call a junk hauling and removal service to dismantle the shed and haul it away. Pickup the phone and call 800-433-1094 or visit Junk Garbage Removal.